A Factual Desert. Biographical and autobiographical readings of Shakespeare’s sonnets feature on both sides of the authorship debate. In order to give meaning beyond a literal reading, a narrative is sought. Since the only named person in the sonnets is Will, with the possible additions of Penelope Rich and Anne Hathaway through the use of punning, any narrative relies upon linking a contextual history to the poems, and postulating why such conjecture is true. The search for explanatory power, enlightening the reader, has taken many forms. But none took place at the time the sonnets were published. Why could this be? Being closer to events of the 1590’s and early 1600’s, it might reasonably be thought that a contemporary reader didn’t require extraneous explanation, because none was needed. In our febrile times, any assertion is open to debate, but all that can be said is that there are absolutely no indications of people attributing theories of meaning or speculating as to the identity of the ‘fair youth’, ‘dark lady’ and 'rival poet' at the time of publication and for centuries thereafter. Nonetheless, 400 years after publication, Shakespeare’s sonnets have become hostage to the narrative fortunes of various authorship candidates via their proponents. The premise being the poems are biographical and therefore should tell us something about the author and subject matter. What follows explores a proposed biographical context attached to claims of Edward de Vere’s authorship of the sonnets. It touches on the ideas of two Oxfordian proponents and evaluates the contextual history employed to support the prince tudor theory. I.e. that the poet is writing to and about his illegitimate son (and heir to the throne) by queen Elizabeth 1st. W J Ray has no doubt that Henry Wriothesley (HW) is the ‘fair youth’. There are many on both sides of the authorship debate who would agree. But how many Oxfordian’s would agree with Ray’s assertion that HW was the illegitimate son of de Vere and Elizabeth 1st, thus providing a narrative explaining the poems? There’s at least one. Ray credits Hank Whittemore with the historical detective work corroborating a contextual narrative for de Vere’s poetic expression. “Divorced from these facts, the 154 Sonnets survived but in a shroud of ambiguity. Owing to the research of Hank Whittemore, writer of 'The Monument', the political facts and artistic expressions make sense together”. Describing it as “revolutionary work”, Ray supports the proposition by attributing meaning to selected lines from the sonnets., “At the outset, De Vere's poems to Wriothesley make sense as the private advice of a loving but desperately concerned father for the future of his royal son”. Whether Ray is punning on the word ‘revolutionary’ or not, he writes “I came upon these ideas myself and thus invented a wheel that Hank Whittemore was already rolling an advanced model of ten miles down the road”. Ray invents a wheel already rolling? Whichever of these fellow travellers invented the wheel, the spokes supporting it vanish under scrutiny. Extending the analogy, the carriage which conveys their theories collapses entirely. 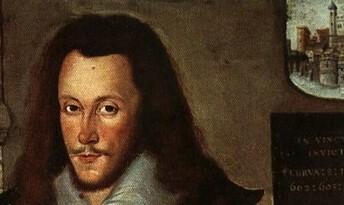 Henry Wriothesley, future 3rd Earl Southampton, is the illegitimate son of de Vere and Elizabeth 1st. Born in secret, the boy is squirreled away and placed with a compliant aristocratic family. What a surprise for Henry Wriothesley snr, 2nd Earl Southampton, his wife Mary Browne and to those responsible for his recent house arrest as a suspected recusant and traitor by prior association with the Duke of Norfolk. Unless Mary used a range of different sized cushions, prearranged months beforehand and over a six month period, to fool those around her every day, the birth would have seemed miraculous! Whittemore’s “revolutionary work” (and Ray’s acceptance of it) is so easily debunked, one has to question whether any work was done on it all. Henry Wriothesley snr (HWsnr) found himself in difficulty, resulting in confinement to the houses (not the Tower of London) of Mr Beecher, Sheriff of London, and thence, to escape the plague, to the home of Sir William Moore at Loseley. The conditions of house arrest weren’t to anyone’s satisfaction. Viscount Montague (Mary Browne's father) writes a draft letter to Robert Dudley, Earl of Leciester explaining that his daughter Mary finds it difficult to stay with her depressed husband, HWsnr. In May 1573, relaxations of confinement and access were confirmed. It is also apparent that despite initial reservations by Sir William, he and HWsnr became friends. 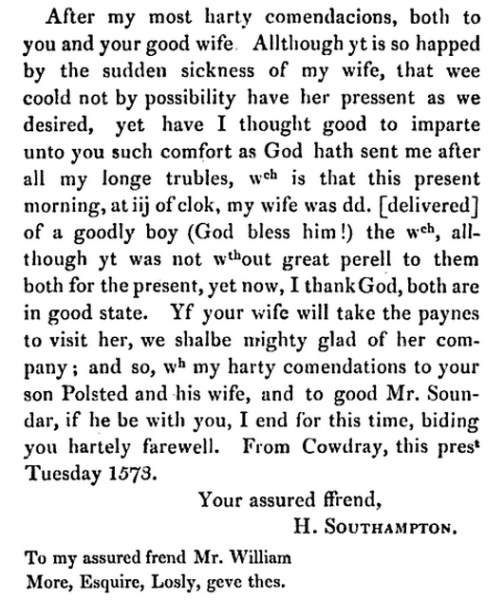 Good relations also existed between Mary and Sir William’s wife, who had been asked to assist as birthing partner. What! Invite your jailer's wife to witness the nesting of de Vere’s cuckoo? I think not. There are possible indications of a premature birth in the letter which announces the delivery of Henry Wriothesley jnr, born at Cowdray House. The original of this letter is in the Folger Shakespeare Library. The movie Anonymous adopts (pun intended) baby HW as the illegitimate heir too. Poor John Orloff and Roland Emmerich. One wonders if it’s occurred to them that they’ve been duped to become Oxfraudian front men. Henry Wriothesley jnr looked very like Edward de Vere and Elizabeth 1st. It was therefore obvious whose son he was. Ray states:- “The first group, up to sonnet 20, is obviously written to the younger man, encouraging him to marry and by all means carry on his bloodline”. 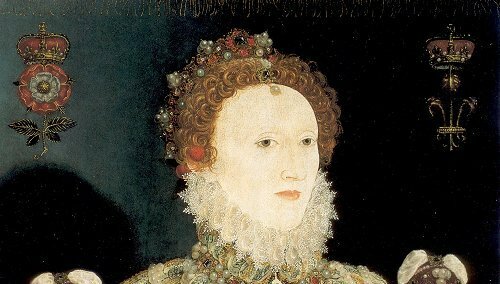 He then adds, “We have learned from court gossip of the time and from Henry Wriothesley’s portrait which so strikingly resembles De Vere, that the De Vere-Tudor-Henry relation was an open secret”. Ray also mentions a familial likeness by quoting from Sonnet 3. “Thou art thy mother’s glass and she in thee” Here, Ray appears to contradict himself by suggesting HW had a stronger resemblance to his mother than to his father. Ray does not provide visual evidence [on his website] of resemblances, so it's provided here. Please take a look at the claimed striking likenesses and draw your own conclusion! Naturally enough, HW was indeed his mother’s glass! No painting of Henry Wriothesley, 2nd Earl of Southampton available. 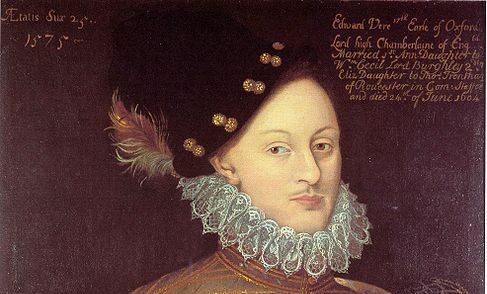 Edward de Vere was in Elizabeth’s favour during 1572 and the pair had a sexual relationship resulting in her conceiving early in January 1573, thereafter concealing her pregnancy and the birth. Note: Elizabeth was acutely aware that her status and behaviour were the subject of constant scrutiny both in England and abroad. She knew there were enemies looking to be rid of her. Court records and surviving letters, from the period following de Vere’s marriage to Anne Cecil in December 1571, confirm rumours the queen was suspected/accused of lewd behaviour and promiscuity. The documents also show de Vere’s ascendancy as a favourite courtier. During 1572 he dislodges Sir Christopher Hatton from the queen’s affection. It’s worth noting that Hatton had replaced Leicester. The advice he received from Dyer is interesting because it confirms de Vere’s favouritism and is suggestive that Hatton previously enjoyed a sexual relationship with the queen. In the extract below, Lord Ctm is Oxford. Hatton had an enduring love for Elizabeth, as the letters confirm. If she replied to his ardent declarations of love and heartbreak, at being apart from her taking a cure for his illness, her letters are lost. As an aside, it’s rather amusing that Hatton uses EveR in his letters. A small sign of affection and absolutely not to be mistaken in any way as a code for Vere! Hatton returned from his cure in the autumn of 1573, surviving an attempt on his life. 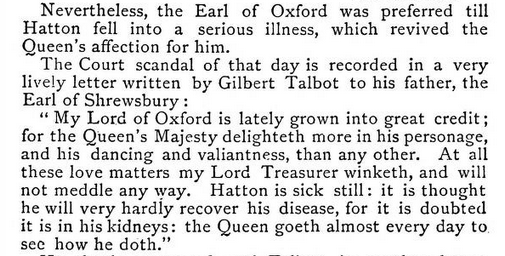 Whatever the reasons for Elizabeth’s ongoing attachment to Hatton, Oxford had been discarded. Despite confirming de Vere had his brief moment of stardom, there can be no room to admit Oxfordian claims of a pregnant Elizabeth and an ongoing relationship with her after April 1573. As for the implication of a concealed pregnancy and birth, there are some very good reasons that debunk it for the nonsense it is. In mid July 1573, Elizabeth is in the midst of public progress to Kent. She visited Dover on 14th. For a woman six and a half months pregnant, and presumably showing it, this seems a bit risky assuming the pregnancy was to remain hidden from the public. On 15th September 1573, Elizabeth writes four letters to members of royalty overseas. Two of the letters are endorsed by de Vere’s long suffering father in law, Lord Burghley. One recipient, was the Duke of Alencon who was involved in the possibility of an arranged marriage to the queen. The record of correspondence shows he was concerned at the age difference and withdrew. Ah, no doubt Oxfordians will say this was because Elizabeth’s pregnancy was known of and that it’s nature, as an 'open secret', was accepted and never mentioned. Not once, not even by an enemy? What about Sir Christopher Hatton? He had been concerned about Elizabeth’s health (Morning sickness! Cry the Oxfordians?) during his trip away. Yet, on his return to court in the autumn of 1573, Hatton and Elizabeth renew their bond and there’s not the slightest indication of anything amiss. Elizabeth is reported to have steadily attached herself to him for some years afterwards. Edward de Vere participates in sentencing Henry to death following the Essex Rebellion, works to reprieve him then acts in his best interests, but fails to have him succeed Elizabeth. 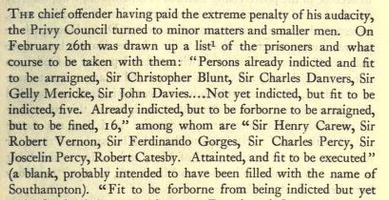 Oxford was Lord Chamberlain and senior noble at HW’s trial alongside Devereux (Earl of Essex) and the other Essex Rebellion participants, including HW’s long time friend Sir Charles Danvers. In the days immediately after the murder of Henry Long by Charles and Henry Danvers, around the 4th/5th October 1594, they were protected at Titchfield by HW. The 6th October was HW’s coming of age 21st birthday. Perhaps Charles Danvers loyalty towards HW partly derives from the protection and assistance he and his brother received in escape to France. From where they bought their way out of trouble by paying fines. The same tactic was attempted in 1601, when Charles offered £10,000 to prevent his execution. He failed. Edward de Vere then enters this episode in history. What was his role? Simply put, he became involved in the squabble over Danvers’ estate. But surely there must be evidence of more than that? We are told by Oxfordians that he was involved in his ‘sons’ reprieve. Actually he wasn’t. HW wasn’t reprieved as such, he was never executed. There’s a difference. There was sympathy for HW. It appeared that his crime was accepted as a folly of association rather than conspiracy and treason. Indeed, Essex pleads this to be the case whilst also accepting responsibility for the appearance of HWs ‘treason’. Essex basically says HW was acting out of loyalty to him and had no bad intentions towards the queen. To some extent Charles Danvers may also have ‘taken the rap’ for HW, according to Charlotte Stopes, HW’s biographer. Any contention that de Vere is involved in reprieving HW is unsupportable. There are no indications de Vere gave HW a second thought. No problem for Whittemore, who argues that HW’s Essex Rebellion and it’s aftermath are a contextual narrative to sonnets 26 to 126, all of which describe “the Poet’s” (de Vere) thoughts and feelings towards his imprisoned and forlorn son! Whittemore claims de Vere wanted HW to succeed ‘his mother’ Elizabeth. Luckily, for the still imprisoned HW, de Vere was in reality proposing a different succession. 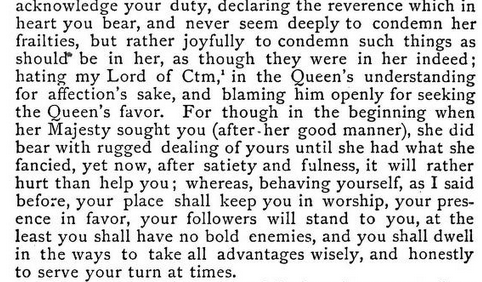 As Sir John Peyton’s report to Cecil in March 1603 demonstrates. (Alan Nelson’s website) consulted 20th August 2013. Edward de Vere arranged a private dinner where he reportedly proposed that the Earl of Lincoln should be concerned about Elizabeth’s impending death and implies it’s his duty to back his [Lincoln’s] nephew “Lord Hastings” succession because he has the royal bloodline! Why luckily for HW? He was still in the Tower. Imagine the consequences to him of being implicated in a plot to replace the queen and usurp James 1st. Oxfordian Prince Tudor theory, and associated speculative narrative, is shown for what it is. Invention, designed to justify patently absurd and unprovable assertions. In a recent article, WJ Ray makes an ad hominem attack on Stanley Wells scholarship and attribution of authorship to Shakespeare. 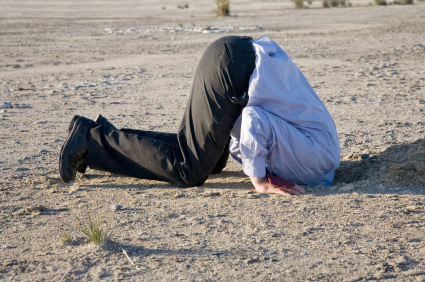 It includes the phrase “Factual Desert”. It is hoped Mr Ray doesn’t claim a copyright infringement for adopting it here, in this article. Intellectual property law being as it is, let’s acknowledge Mr Ray’s phrase as belonging to him. In more ways than one!